The house pictured had already begun sinking into the ground a while ago, making it more susceptible to flooding. According to a climate scientist, flooding in this area isn't normal in February. "It’s like getting April weather out there. Not enough thickness, not enough snow, and already lots of water," said Morris J. Alexie, the tribal administrator for Nunapitchuk. The rain flooded an older house that had already begun sinking into the ground. Thomas Parks is a Nunapitchuk tribal council member who works with Alexie. Parks heard about the flooding and immediately started calling around to see how he could help. He says that the house is uninhabitable. "Everything was all covered up, all the beds were soaked up, the couch was soaked. The Toyo stove that was sitting a foot and half up from the floor, it was also halfway covered up," Parks said. The flood damage in Nunapitchuk appears to have impacted only one house so far, but the community is bracing for more down the road. Winter storms also hit Kotlik a few weeks ago, flooding six houses. The flooding is just another example of climate change in the area, according to Rick Thoman, a climate scientist in Alaska. Thoman says that this February was the warmest on record for Bethel, the hub of the Yukon-Kuskokwim Delta. He also says that the recent flooding was caused by warmer oceans and less sea ice. "Because the Y-K Delta, especially the Y-K Delta and Kuskokwim delta, precipitation is often occurring with temperatures not very far from freezing. Even a slight shift, a little bit of warming, can push you across that threshold," Thoman said. So storms that blow across the region will bring more rain to communities that are already experiencing less ice and snow. Nunapitchuk is in the heart of the Kuskokwim Delta, surrounded by several lakes, big and small. The longer warm periods mean that the tundra and lakes don’t remain frozen for very long and result in thinner lake ice. Kotlik sits on the Yukon River near the Bering Sea on the southern end of Norton Sound. What happened there is a little crazier. "There’s basically no ice, no ice in southern Norton Sound. And then the storm came along and had very strong southwest winds: 50, 65 miles an hour across Norton Sound. And that just piled up water into eastern Norton Sound, so you had big waves crashing at Unalakleet. And that water backs up into the Yukon River, which got a little ice in it, and so it just overtops that ice," Thoman said. Kotlik is looking for assistance from the state to help out residents who own the damaged houses, and the threat of more floods continues. That’s according to Kotlik tribal administrator Victor Tonuchuk. 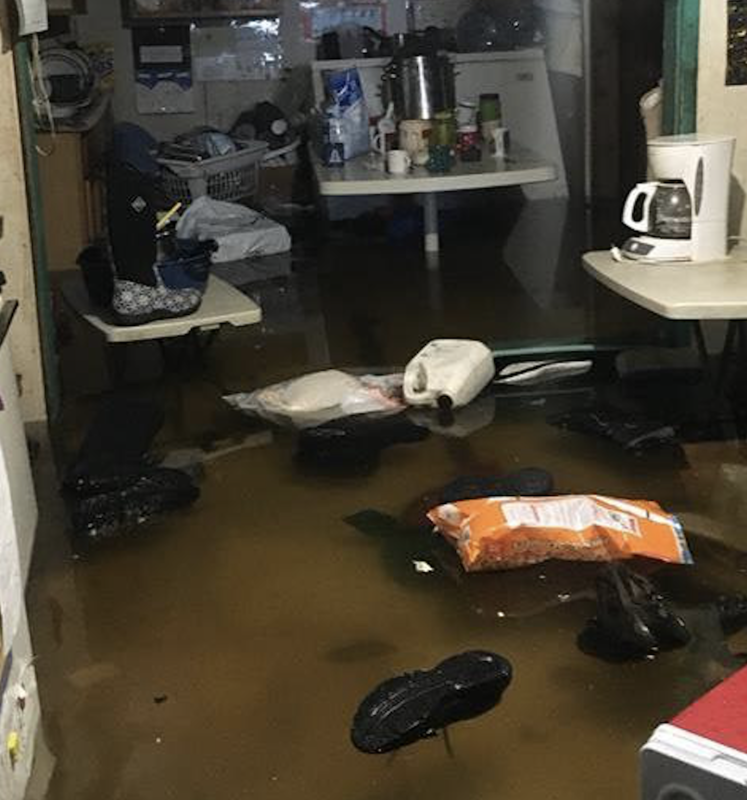 "As we speak right now, we are in like the, for we’re having a under a flood advisory warnings, so our water is pretty high right now," Tonuchuk said. Kotlik’s Tonuchuk says that the community is beginning to consider moving. This is becoming a familiar theme in the Y-K Delta as villages grapple with warmer winters, accelerating erosion, and now flooding.